Have you ever had a crush on somebody? Embarrassingly enough, I had several. They neatly section phases of my life through my teenage life. Mostly girls but some guys too, I fell head over heels and began imitating their actions. I admired them — they’re my role models and peers at the same time — and I began to be more conscious of my surroundings thanks to them. It may not be an exaggeration to claim that my current personality is the culmination of the crushes I had on people over the years. I was able to date some of them for a period of time, so I suppose they weren’t really crushes anymore. But the ones who really impacted me as a person remained symbols in my head. They couldn’t be approached by ordinary means and I lacked the courage anyway. I admired them too much, so I just glanced at them until we both had to move on our lives. That’s how I always see high school crushes in life and media. They are not something you are trapped by forever, but they are sometimes fun and sentimental to ponder about. Even an anime like つきがきれい (tsukigakirei) where the high school couple gets together in the end isn’t always realistic. I knew a high school couple who everyone thought was fated to have a happy marriage; unfortunately, they were going to different universities in different countries. Of course, long distance relationships were a possibility, but those four years were going to be tough on them. They broke up in the end after graduation. I don’t know what happened afterwards, but I like to imagine they somehow got together in the end anyway. Else, it would be too sad. Even if it’s more likely they’ll find someone else before then, I feel like that would be more romantic. Romanticism is always parallel to reality, but we can still dream. Not if you’re Ii-chan. He gave up romanticizing love and dreams. He doesn’t believe he deserves an ounce of love. The world has given up on him and he has given up on the world. Life isn’t some cute high school anime about girls eating cornets. It’s depression, boredom, ennui. You let the river of life move you to where you need to go and ignore the traffic around you. Love makes no sense, especially to someone who deals with nonsense in life. What’s the point of caring about love? He is skeptical and deeply distrustful that anything good will ever come out of it. Romance can only be a delusion that will break and thus shatter anything resembling hope and faith in the world. It may be better to not love than find yourself wallowing in the alleys of reality. But the romanticist Aoii Mikoko (葵井巫女子) still loves Ii-chan anyway. Love is blind and Mikoko is blinder. To the surprise of her friends, she wants to date Ii-chan. There’s something about him that attracts her and we as the readers don’t exactly know what. We can hypothesize, but love tends to be an irrational force anyway. Putting love into words is unromantic. So she just likes him. That’s as good a reason as any. She is an optimist, a sunshine that brightens up the room. Her silly antics make any sullen frown into a honest smile. Mikoko can sense the mood of people and try to find something to say. You can count on her as an icebreaker. Hell, she could even get Ii-chan talking. Ii-chan of course doesn’t remember who Mikoko is; apparently, she is one of his classmates. But he gets invited to a birthday party of someone he hasn’t met: Emoto Tomoe (江本 智恵) turns 20 on May 14 and wouldn’t he like to come? Usami Akiharu (宇佐美秋春) and Atemiya Muimi (貴宮むいみ), Ii-chan’s other classmates, will be there too. It will be fun. He can drink, play video games, and have a great time. That’s what college students should do when they don’t have to study up for exams: hang out and have a beer together. It’s the kind of life we like to lead. A birthday party is a good representation of how society works. Parties are always innocent fun. You can let loose and forget your worries with friends and acquaintances. If you don’t know anyone, you will know people. There are no such thing as strangers because you all are invited. Don’t be shy. There’s people who are interested in you. No one gets hurt and everyone gets a can of beer. We all drink to the happiness of tomorrow because we are all buddies sharing a Budweiser. But beneath the veneer of relationships, we can see the light of envy seeping through the cracks. A tinge of jealousy can sprout into hatred. Passion can bloom into enmity. Joy can flower into depravity. Good people don’t wither and transform into bad people overnight; they might be committing evil crimes because they are good. They are only following their code of ethics without realizing they may have done something we would see as terribly wrong. A party can be good fun, but the partygoers won’t notice tomorrow might be a bad day. This society, this party thus allows people like the serial killer Zerozaki Hitoshiki to slip in and slit innocent people’s throats. When Ii-chan and Hitoshiki meet, it is like love at first sight. Hitoshiki is Ii-chan’s mirror, an alternate path the narrator could have taken if the impulse to kill pulsated in their body. No motive guides the knife into the vocal cords of his victims. He is an indiscriminate killer who picks people off the street the same way we would order something from a menu. That’s why people haven’t been able to find him. A motive is always a good clue as to why people could murder others. Serial killers are also often easy to distinguish from others because the police force has amassed a huge array of patterns to create a profile. Based on demographical data and criminal psychology, forensic investigators and criminal pathologists could narrow down the search to a few suspects. But Hitoshiki’s behavior is abnormal for the normal category of serial killers. He remains invisible in the eyes of society because we stereotype serial killers. In reality, serial killers may not be that different from ordinary people. That’s something Ii-chan and Hitoshiki recognized when they begin hanging out in the karaoke bar. Their hijinks remind me of buddy cop films as they investigate the murders that happen in the book. Even a mass murderer can offer some good advice on investigation once in a while. Their relationship, while unrelated to the case overall, becomes the main crux of the book. Ii-chan calls his doppelganger a human failure — a 人間失格 to be precise, which is a reference to Dazai Osamu’s most famous book — while Hitoshiki refers to his clone as a faulty product (欠陥製品). Both Ii-chan and Hitoshiki have renounced their humanity for their past actions. They deserve no affection and should be labeled as outcasts — strangers who shouldn’t have been invited into a party. The twins are only troublemakers who disrupt the peace of society. The romantic may argue they still have a place in society. Maybe not Hitoshiki but Ii-chan hasn’t done anything wrong. If anyone — truly anybody — can be invited into the party, surely Ii-chan is allowed to stay. We can invent reasons, instill meaning, and defend them against the nihilistic gavel of justice. We could also say, “Without love, it cannot be seen”. It being the reason why people matter in life. There’s a grain of truth in that. Most people aren’t truly evil and, as far as we have seen, Ii-chan is innocent and in fact quite likable. If we love someone, then we can understand why they have to do what they need to do. It is romantic and inspires a kind of poetic justice that settles the case in shades of gray instead of black-or-white terms. But isn’t that just a case of rationalization? Is that reasoning okay to let people off the hook for their crimes? Can murder ever be justified? Writing the taking of someone’s life away as a tale of romance is nauseating to think about. Slaying someone in the name of love feels wrong. Love, a complex chain of emotions, has become a fanatic slogan of the delusional. If such a motive has to ever be expressed, its distortion of love can only be written in the most depraved of languages. The minute we have that type of love is the minute we see the debasement of ourselves. Only an objective, dispassionate observer — a wallflower — could describe atrocities without recourse to morals and motives. We can grant minor cases like theft some leeway: people may steal food because they are hungry and poor. But cold-blooded murder? No excuse. Motives have very little place in mysteries and only distract the reader from the crime of murder like how forensic pathologists are fooled by Hitoshiki’s simple lack of motive. Empathy for the murderer might be justified, but there is no place for them in the book. It is this fact of life that distinguishes humans from nonhumans. You lose your right to call yourself human once you let someone die by your hands. Hitoshiki has forfeited his right a long time ago and is proud of that, but anyone who claims to be human after a murder is only fooling themselves. A murderer will always be a murderer. Kubishime Romanticist: Human Failure, Hitoshiki Zerozaki (クビシメロマンチスト 人間失格・零崎人識) is a cynical treatise on the dangers of optimism coloring our perceptions of the world. Naivety trips us into peril. Innocence is another word for gullibility. Our lack of experience misleads us into trusting anything that resembles a force of good. It is our ignorance — our love — that dooms us into oblivion. To come of age means to recognize the appropriate times to love and empathize. Otherwise, romance can only strangle us; we remain asphyxiated without recognizing the rope is on us. Thus, not all loves are equal. Most are destined to be crushes, something we can dream about but then forget later on in our lives. Passion can never be the reason to accept the love. It always depends on whether we deserve it or not. 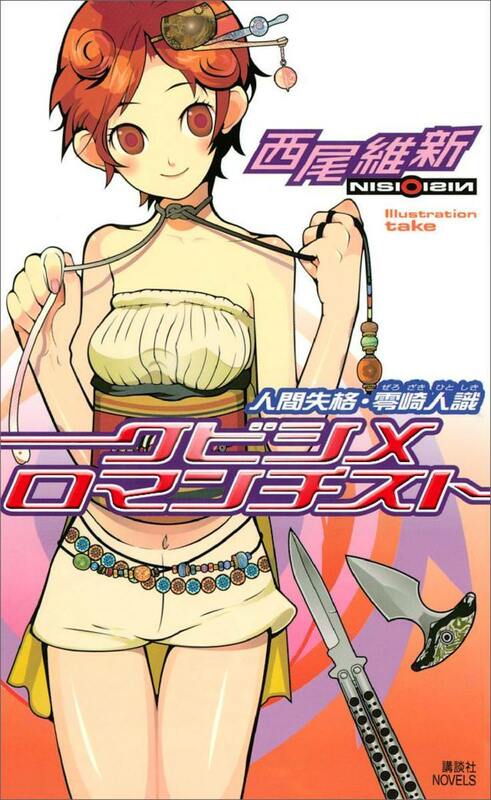 Nisioisin was indeed stimulated by passion when he wrote the book in a mere three days, but its cold realism leaves little space for skepticism. He probably sees Ii-chan as deserving of some form of love or affection; this book however isn’t the right avenue for it. That “not being the right avenue for it” may be the sole motivation to write this book. It is also where the Zaregoto series has stopped conforming to the mystery playbook. Kubishime Romanticist is set in an everyday Kyoto and the city’s geography can mostly be traced in the book. It abides by a sense of realism (Nisio actually tried to research the interiors of the police department before giving up). And while Hitoshiki’s murders are over the top, everyone’s actions are surprisingly grounded and don’t appeal to some higher ground or morals. Kubishime‘s Kyoto is thus no place to play mysteries or think up thought experiments. Real people live here and we shouldn’t disturb their peace. Reading it as a mystery book will only lead to trouble. The twists, while good, are impossible to predict and the narration breaks the laws all the time. There is no fair play unlike Kubikiri Cycle. The mysteries are plainly unsolvable. That of course breaks with the tradition of orthodox mysteries. The romance of the game is shattered. It doesn’t feel like a sport anymore. It’s too real now. Nothing about it feels fictional nor cute. But that’s how real life mysteries work. No actual murderer follows some game rules thought up by dead British folks. Real humans live and die by the game we like to call mysteries. There is no fourth wall when it comes to the act of murder. To deny it is to deceive yourself from reality. Of course, there will be people who demand a barrier between fiction and reality. It is possible to imagine the world of art separated from our world of politics; mysteries likewise can still be games filled with romance and adventure if we elect to create a division. This justifies our blind love for the genre. Letting go of our fantasies would be a shame to us all. It gives us meaning to our escapism and let us be happy and forget the dark sides to life. This rationale can be simply and collectively dubbed as the romanticist approach. To be honest, I don’t view it as a bad view to life. I can somewhat empathize with it a bit. To love something so passionately without recognizing its implications makes living life easier. But I find it hard to stomach. I’m sure Ii-chan would agree: it’s just one huge excuse. The callowness of it all demeans actual love and acceptance. Such a love — such a romanticist approach — has to be rejected. An easy love is an easy no. School is starting soon.